That The Simpsons’ 600th episode falls on a “Treehouse Of Horror” is for the best, ultimately. Milestone episodes, event episodes, episodes built around a huge guest star—these are not generally great Simpsons TV, as the show tries to craft a story around something external. While the annual “Treehouse Of Horror” episodes traditionally get decent ratings, and have produced some classic scenes over the decades, the expectations are lower regarding character development, plot, or general coherence. The Simpsons’ Halloween tradition is for quick-hit horror and sci-fi parodies, a heap of references, some gratuitous bloodshed, and the occasional actual smidgen of heart. Grading on that curve, the 27th installment does its job, for the most part. The promotional materials, including the usually amusing snarky screener announcement sent to critics (or “critics” as such people are called within), hyped the return of still-hotly-debated Homer nemesis Frank Grimes, or at least the poor guy’s ghost. And the opening segment sees the Simpsons in costume, buying Christmas trees on Halloween, as Homer says, “Because in America, everything’s way too early.” (He’s wearing an “Ivanka 2028” campaign button, because nothing matters in America at this point.) There, they’re confronted not only by the ghost of Grimes (“Who?,” asks Homer, to the ghostly Grimes’ chagrin), Sideshow Bob, Kang (or Kodos), and that leprechaun who tells Ralph to burn things, who proclaim themselves the family’s four evil nemeses before being immediately slaughtered by Maggie. (What looked like her Chaplin costume turns out to be her old Alex DeLarge costume, complete with sword cane.) Adios, Frank Grimes—you were used for a throwaway gag, as is your destiny. The pieces that follow all partake of the same strengths and weaknesses. Longer than the average episode by a minute or so, each of the four has a little time to breathe, which the writers use to pack in plenty of references, both to Simpsons lore and the movies being parodied. I say “reference” because that’s the level they’re all operating on, more or less. On a normal episode, Homer (as Woody Harrelson’s drunken mentor from the Hunger Games movies) pronouncing “Also, I sober up in the middle with no difficulty just like real alcoholics!” would be more tiresome in how it draws attention to itself without being especially funny. On a “Treehouse Of Horror,” there’s no time for subtlety, so the joke gets the nod of recognition it’s going for before the segment marches on. Lisa is the Katniss of the story, naturally, with Mr. Burns’ monopoly on drought-stricken Springfield’s water supply bringing in Mad Max: Fury Road gags aplenty once Lisa and her now-trained gladiators storm Burns’ reservoir. But there are some touches of the actual Lisa in there that lend her plight a bit more substance. Rachel’s revelation that she comes from where Lisa’s “darkest thoughts live” is evocative, especially when we see Lisa’s dream of driving with a dead deer strapped to her pickup, running over the Buddha, and a whole lot of saxophones. Once Bart helps her escape from jail, her realization that her imagination can will things to life sees her conjure up a motorcycle that runs on pony-smiles, which is just right. And, while not overdone, Lisa’s complaint to the vengeful Rachel, “Why can’t a real person like me this much?,” at least puts an emotional bow on the story. And the fact that Homer’s imaginary friend who (unsuccessfully) comes to the rescue is a giant wiener named Sergeant Sausage made me laugh. 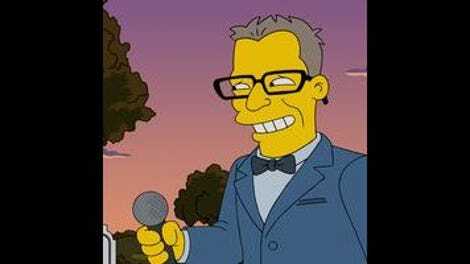 When the segment closes out with a Shirley Bassey-styled Bond anthem, the lyrics take shots at just how long The Simpsons have “churned out” 600 episodes of television. (Before really making this reviewer feel old by running a crawl of all the “shows that were bad” that aired during The Simpsons 27-plus years.) Simpsons fans love to argue, rank, and make very boring “is that show still on/not as good as it used to be” jokes, and God bless ’em. But that’s a lot of television, and this annual celebration of the fanciful fringes of the show’s world might not have been the best, but it wasn’t the… worst “Treehouse Of Horror” ever. At this stage, I’ll take it. See, Fox? Send out a screener once in a while and you get a screencapped sign gag! The couch gag takes the form of “Planet Of The Couches,” where the Simpsons flee in a world where couch rules man. Despite its having helped them escape, Homer brains their couch and they al sit on it. Poor couch. I know he’s just here as a gag, but lumping Grimes in with the likes of Sideshow Bob doesn’t sit right. Grimes’ kid, maybe, but this just seems another injustice heaped upon poor Grimey (as he liked to be called). Lisa refers to the parched Springfield as being in a “drought of Chicago Cubs-like proportions.” So, considering the show’s scientifically documented history of completely, 100-per-cent true psychic predictions, what are we thinking here, Cubs fans? Ms. Mancuso-Gluckman is played by singer songwriter Judith Owen, who also happens to be married to Harry Shearer. Everyone in Sherri and Terri’s family has rhyming names, so Drew Carey (as himself) mistakenly shows up at their funeral. Which is about as funny a joke as that sounds. 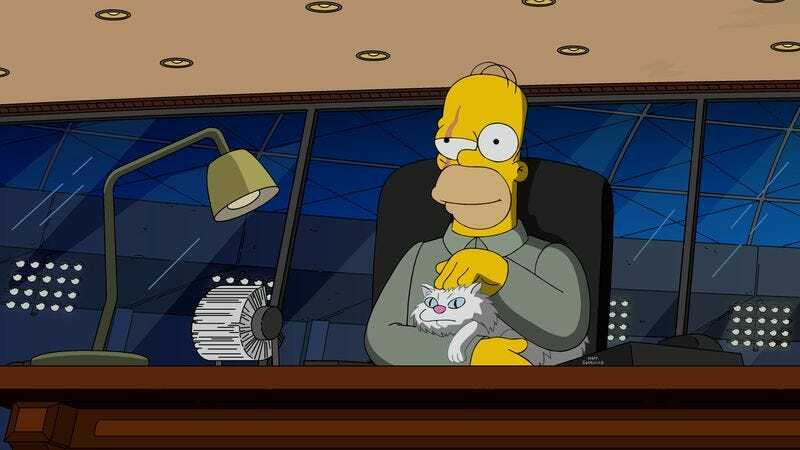 Evil Homer got his Blofeld scars from his appropriately evil cat.